1. Full floor-length A-line finely pleated dress with an empire waist, finely smocked to form a yoke and high fitted collar, as well as large finely pleated sleeves finely smocked to form slightly-pointed cuffs in iridescent teal/copper silk or silk-like fabric (teal/copper cross-dye preferred). The collar is trimmed with two lines of iridescent copper seed beads while the sleeves are trimmed with lines and a small fringe of iridescent copper seed beads. The skirt should have structure (hoop skirt recommended). Costumer should appear pregnant. 2. Long A-line double-layered overcoat with a large, round folded collar, an asymmetrical hem beginning at knee-length in the back descending to mid-calf in four layered triangle points in front, a layered split up the back, defined shoulders and side front slits for the arms, all in a teal/copper burnout velvet of an abstract, pod-like pattern with teal spots. No panne velvet. 3. 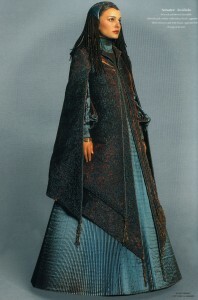 The overcoat has an applied scrolling, vinelike pattern with Naboo symbols imbedded in an iridescent teal/copper silken along the edges, the front hem corners and around the shoulders, and is trimmed in a narrow teal/copper silken cord. The pattern may be couched cord or finely painted. 4. Beaded balls with long bead tassels in iridescent copper seed beads are at each sleeve point, the four front points, the four bottom points and the center back at the top split. 5. Elongated hexagonal filigree brooch in matte copper with touches of teal. 6. Low heeled coordinating tailored pumps or flats. 7. Fitted filigree headpiece of matte copper with touches of teal in the cutouts, and large, contoured ear pieces in a matte teal blue with thin coiled ringlets/dreadlocks and strands of iridescent teal and copper beads streaming down. A large matte copper hairnet or caul descends from the back of the headpiece, studded in drops of iridescent copper and teal beads. Naturally occurring hair colors only, no bangs.